There are a variety of methods we use for helping customers upgrade to a new SQL Server version, and one question we often get asked is whether or not statistics need to be updated as part of the upgrade process. Yes. Update statistics after an upgrade.� Further, if you’re upgrading to 2012 or higher from an earlier version, you should rebuild your indexes (which will update index statistics, so then you just need to update column statistics). After you upgrade from SQL Server 2000, update statistics on all databases. Use the� sp_updatestats stored procedure to update statistics in user-defined tables in SQL Server databases. This step is not necessary for upgrading from SQL Server 2005. Current Microsoft documentation related to upgrading does not state anything specific about updating statistics, but people continue to ask and if you peruse forums, blog posts, and other social media options, you’ll see recommendations to update statistics.� Further, the documentation that Microsoft provides about� when to update statistics does not mention anything about upgrades. Side bar: I don’t recommend using sp_updatestats, and here’s why: Understanding What sp_updatestats Really Updates. Microsoft suggests that customers� test the need for a full update of statistics after a major version change and/or a database compatibility level change. If Microsoft updates the format of statistics (e.g. the stats blog), customers will be expected to update statistics after an upgrade. Microsoft does not always upgrade the statistics format as part of a major version upgrade. There are occasions where Microsoft does not change the format of statistics, but they do change the algorithm for creating statistics as part of a major version upgrade or database compatibility level change. In addition, there was a change in the nonclustered leaf level internals in SQL Server 2012, so if you are upgrading to 2012 or higher from an earlier version (e.g. 2008, 2008R2), rebuild your nonclustered indexes. And remember, rebuilding indexes updates the statistics for those indexes with a fullscan, so you do not need to update them again. Updating statistics is an online operation, therefore, the database and related applications are accessible and usable. A statistics update does take a schema modification lock so you’re not allowed to make any changes to a table while its stats are updating. Therefore, if you decide to change your schema after upgrading your SQL Server version (not something I would typically recommend), do that before you update stats. You need to update statistics regularly to provide the optimizer with current information about your data, so at some point it needs to be done. Immediately after an upgrade is a really good time, considering the aforementioned items. In last week’s post I discussed the basics of how automatic updates to statistics occur in SQL Server. This week I want to talk about scheduled (aka manual) updates, because as you might remember, we really want to control when statistics are updated. You might think you want to update All existing statistics. If you just had a plan with just this task, that might be true. But what I see most often is that someone configures the Rebuild Index task, and then has the Update Statistics task as the next step. In that case, if you are running SQL Server 2014 and below, you want to update Column statistics only. When you run the Rebuild Index task in SQL Server 2014, you rebuild all indexes, and when you rebuild an index, its statistic is updated with a fullscan. Therefore, there is no need to update Index statistics after you rebuild all your indexes, but you do need to update column statistics. This is a bit more complicated in SQL Server 2016. The Rebuild Index task has more options in SQL Server 2016, which is nice for that specific task, but it makes providing guidance about statistics updates a bit trickier. In SQL Server 2016 you can configure the Rebuild Index task so that it only rebuilds an index if a certain level of fragmentation exists. Therefore, some of your indexes will rebuild (and thus have statistics updated) and some will not (and not have updated statistics). How do you manage that with the Update Statistics task? Well, in that case you probably select All existing statistics and update some statistics for a second time, which is really a waste. Therefore, if you’re on SQL Server 2016, you probably want to look at more intelligent updates. One method, which I would not say is intelligent, but it is an option, is to use sp_updatestats in a scheduled job that runs on a regular basis. This command is one you run for a database, not for a specific statistic or index or table. The sp_updatestats command will only update statistics if data has changed. That sounds good, but the caveat is that only one (1) row has to have changed. If I have a table with 2,000,000 rows, and only 5 rows have changed, I really don’t need to update statistics. The other method is to use UPDATE STATISTICS in a scheduled job. The UPDATE STATISTICS command can be run for individual statistics or for a table (updating all statistics for a table). You can develop an intelligent method to use this command, which is what I recommend. Rather than a blanket update to all statistics, or statistics where one row has changed, I prefer to update statistics that are outdated based on the amount of data that has changed. Consider the aforementioned table with 2,000,000 rows. If I let SQL Server update statistics automatically, I would need 400,500 rows to change. It’s quite possible that with a table of that size I would want to statistics to update sooner – say after 200,000 rows had changed, or 10% of the table. *You’re correct, I technically didn’t change ProductID to a new value, but SQL Server doesn’t know that. Also, there’s a foreign key on that column which is why I can’t easily change it a random number. Armed with this type of data, we can intelligently decide whether we should update statistics because a percentage of rows (rather than just a fixed number of rows) have changed. In the example above, only 8% of data changed – probably not enough to require me to update statistics. It’s quite possible that some statistics need to be updated daily because there is a high rate of change, and other statistics only need to be updated weekly or monthly because data doesn’t change much at all. Ultimately, when it comes to scheduled updates of statistics, you can go the sledgehammer route (Update Statistics task or sp_updatestats) or the selective update route (UPDATE STATISTICS and sys.dm_db_stats_properties). 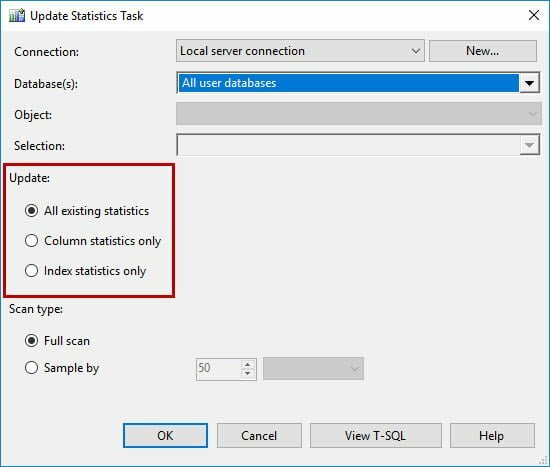 Using the Update Statistics task or sp_updatestats is easier if you’re not familiar with SQL Server and if you have the maintenance window and resources for it to run. To be perfectly clear: if you’re a system administrator and want to update statistics, I’d rather you use this approach than nothing at all. Presumably, if you don’t have a full-time DBA, you also don’t need the system to be available 24×7, so you can take the performance hit at night or on the weekend while all statistics update. In that situation I’m ok with the approach. But, if you are a DBA and you know how to write T-SQL, then you can absolutely write some code that programmatically looks at your statistics and decides what to update and what to skip. Whatever method you use, just make sure your updates are scheduled to run regularly through an Agent Job, and make sure you have Auto Update Statistics enabled just in case the job doesn’t run and you don’t get notified for some reason (this would be Plan B, because it’s always good for DBAs to have a Plan B!). Sample Size and the Duration of UPDATE STATISICS: Does it Matter?